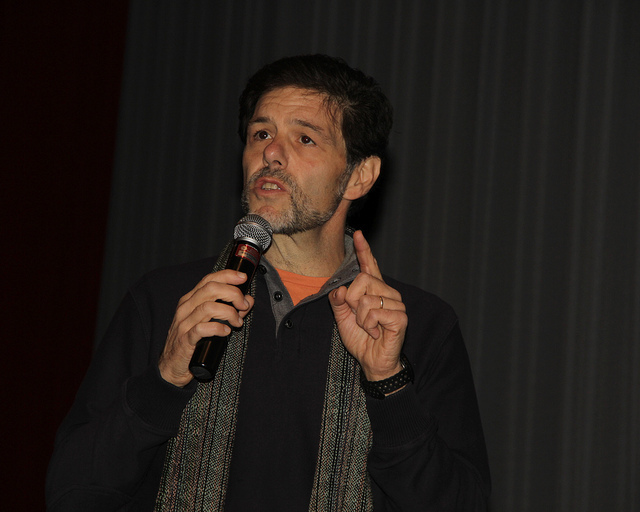 Filmmaker Stephen Vittoria spoke at the screening of his film at DOC NYC. Thom Powers, DOC NYC’s Artistic Director, opened Saturday’s screening by calling LONG DISTANCE REVOLUTIONARY: A JOURNEY WITH MUMIA ABU-JAMAL “a different look at [Abu-Jamal’s] career, and a richer look.” He then handed the screening over to director Stephen Vittoria, who thanked DOC NYC for having “the courage and the commitment” to support his film. LONG DISTANCE REVOLUTIONARY chronicles Mumia Abu-Jamal’s professional and political life, from his start as a journalist for the Black Panthers at age 15, to his accomplished career in public radio and his prolific books and broadcasts produced from his prison cell. (Abu-Jamal is serving a life sentence after being convicted of killing a police officer, a crime he says he did not commit.) Interviews with Abu-Jamal’s friends and supporters, including Amy Goodman, Dr. Cornel West, Giancarlo Esposito, Alice Walker, Angela Davis, Tariq Ali, and Dave Zirin are intercut with Abu-Jamal’s own words, read by himself in recordings of his broadcasts as well as by spoken-word performers. Abu-Jamal is positioned as a valuable political theorist and a necessary threat to institutionalized racism in the US. As the credits began to roll, a chant from the back of the theater was heard over the applause: “Free Mumia! Free Mumia!” Several audience members left the theater during the credits, prompting activist Pam Africa to stand up and declare, “Please don’t leave, because we need your help.” This activist spirit culminated once Vittoria, Prison Radio’s Noelle Hanrahan, and journalist Juan Gonzalez took to the stage, when the filmmaker Q&A transformed into an organizing meeting. At one point, professor Johanna Fernandez, Ph.D., a coordinator for Educators for Mumia Abu-Jamal (EMAJ), stood up and posed a question to the audience: how can the film be used as a tool to free Abu-Jamal in the next five years? “I think that we can free Mumia,” said Fernandez, “but we have to start organizing now.” The screening provided an opportunity for activists, educators, and members of the Free Mumia Coalition to collaborate and discuss their strategies. Even with the audience’s shift in focus, Vittoria did have the opportunity to respond to some questions about the filmmaking process. When asked if he considered making LONG DISTANCE REVOLUTIONARY more mainstream in an effort to appeal to a larger audience, Vittoria simply answered, “No…I wanted this film to be incredibly radical. I didn’t want to compromise one iota.” As for what viewers can do to ensure the film has an impact as a piece of activism, Vittoria and Hanrahan implored the audience to fill the screenings at Cinema Village when LONG DISTANCE REVOLUTIONARY opens in New York City on Feb. 1. Carrie Nelson is a writer and filmmaker, committed to using media to advocate for social justice. Follow her work at www.carolyn-nelson.com.